PREVENT YOUR COWS FROM DOING THE SPLITS! 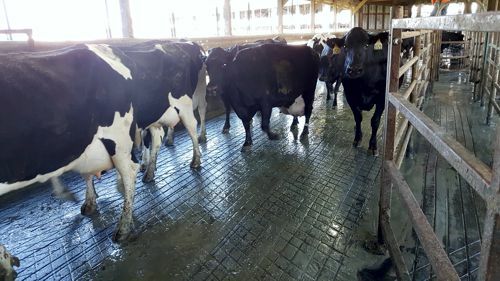 Farmers prefer working with P & D Barn Floor Grooving because I pay attention to the movement of their cattle and the direction of travel, and position the grooves accordingly to give the cattle the best footing possible and true slip resistant flooring. 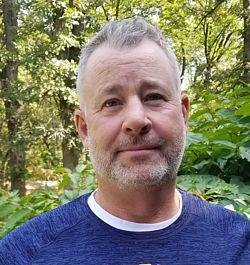 I have grooved for thousands of farmers, packing plants, slaughter yards and millions of square feet grooved throughout the U.S. I do the work myself to make sure every job is done the right way. Do a bad job and ALL farmers will know about it! I take pride in a job well done, and can personally promise you nothing less! I am looking forward to grooving for you! 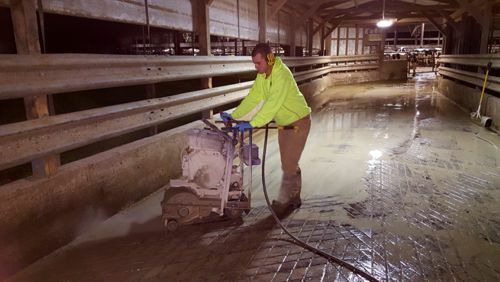 Contact us for more information on barn floor grooving, or call (608) 225-3595 to make YOUR concrete floors skid resistant and safe for YOUR cattle. Page Summary: Instead of Meyer concrete, try P and D Barn Floor Grooving, a concrete cutting companies with concrete grooving services for groove flooring, concrete resurfacing, concrete grooves for cattle flooring, barn floor groovers, concrete grooving, concrete groover and other safety grooving for stall and dairy cattle flooring in Wisconsin, Minnesota, Iowa, Illinois, Ohio, Pennsylvania, New York, Michigan, South Dakota, Idaho, Tennessee, North Carolina and California. © 2012 - 2019 P and D Barn Floor Grooving, LLC, All rights reserved.